Independent with Jookender!© - once again, Jookender is inviting you to travel together - this time - to Europe! The journey starts on 04/09 - just 3 days before the official April School Break Vacation! We will be happy to provide you with a letter to your child's school explaining why would your child miss the last 3 days before the school brake. On this 10 days Trip, your family will be able to visit Berlin, Potsdam, and Dresden (Germany), Prague (Czechia), Wroclaw and Krakow (Poland). You and your Teens, age 14 and up will also have an opportunity to visit Auschwitz- the most widely known concentration camp in Eastern Europe, and to learn more about Jewish Settlements before the World War II, and the History of Holocaust. Your Journey doesn't start on 04/09 - it starts when you have purchased this trip. Once it happens, we'll introduce your family to others families that have already joined, and run a few online and offline events for all families that will come together for a trip in April. You don't have to live in Boston to be able to participate in this trip. We welcome all families from all over the World to join us. While Air, Hotel, and Car is not included in the price, we will be with your all the way, learning great deals and savings on them, and making sure, you know where the other would stay. If you're bringing younger kids with you for the tours, we make sure, they are also taken care off, and create an alternative schedule for them (one parent must be present with your child), so they won't need to come with their older siblings all the time. Please, be aware, that once the tour is purchased, you have only 48 hours to cancel it. The Tour is non-refundable after that time. We suggest that you purchase an overall Travel insurance to cover everything, from your air tickets to this tour, and in-between. The price is $350 per person (Early Bird Special $300 until Nov. 30, 2018). Each person in the family needs to purchase the tour, and we're not allowing siblings younger 6 y. o. to join at all. Here is the link for your tickets: https://www.justfly.com. However, you're welcome to find another flight. It's just that 19 people have already purchased this one, and it's great to start our Journey together, right from Boston, MA! The complete schedule will be available closer to the event, but once registered, you'll be able to join parent's conversational messenger group on Facebook. If you're not on facebook, we will be sending you all updates via email. It seems complicated, but once you try it, you won't think of traveling any other way! It's really simple, easy, and always on budget! And, you have all flexibility in the World! 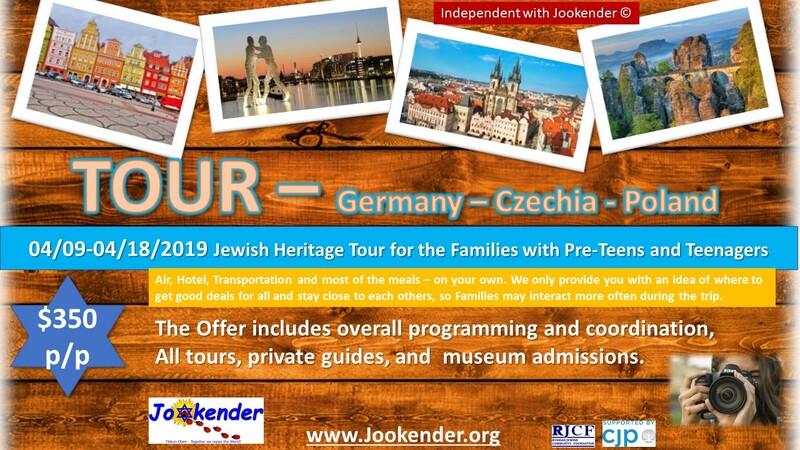 * This tour is geared to secular Jewish Community.